Act! Premium will keep your business organised with a single view of all the interactions with everyone you do business with and help you to market your products and services more effectively. Purpose-built to manage larger teams and work-groups of 10 or more with ease, whether office-based or in the field. Act! Premium provides the tools to equip individuals, sales teams, and small businesses with everything they need to quickly tap into all relationship details, propel productivity, and make insightful decisions. Act! Premium has all the benefits and integration of Act! Pro with added functionality, Windows and Web deployment options and includes the Act! Mobile application. With Act! Premium you are informed and prepared for every interaction within your business, enables you to access and edit a wealth of customer information from anywhere. Manage Opportunities, Contacts and Leads– Build productive relationships by easily accessing and editing key customer and contact details. Manage all key contact, opportunity and lead data for maximum sales productivity and effectiveness by tracking probability of close, lead source, status, products and competitors. Lookups and Groups – Use the advanced query tools to organise customers and prospects by grouping similar contacts using advanced query tools, to deliver targeted email marketing messages or sales offers to select customer segments. Mobility – Stay connected by accessing Key Contact, Opportunity and Calendar details from your iPhone®, iPad® or Android™ device with Act! Mobile. View, add and edit customer information held within Act! when working remotely. Act! Premium helps to automate and manage daily task for you and your teams freeing up invaluable time to focus on your customers and sales. Activity and Calendar Management – Keep track of activities and events, manage schedules for you or your team on a shared calendar; get the most out of your business day. Group Scheduling – Designed specifically for workgroups with scheduling, dashboard and reporting capabilities for teams of workers. Reports and Dashboard – Gather critical business intelligence quickly, including email campaign effectiveness, revenue by lead source, pipeline efficiency and more. Allows you to evaluate performance and guide strategic improvements. Additional Security – Advanced security settings available, including different levels of access for different types of users. Act! 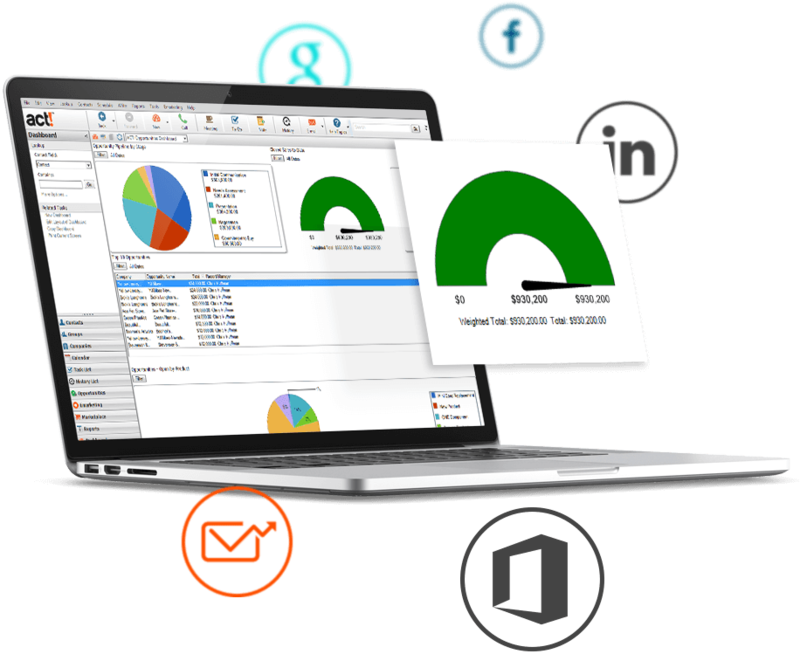 Premium seamlessly interacts with the business and social tools relied on every day, add-ons link with Sage 50 Accounts and more. 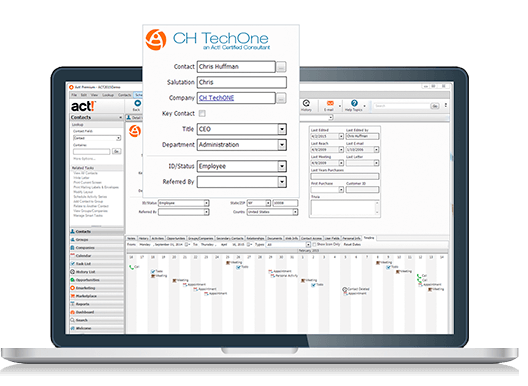 Integration – interact with Microsoft® Outlook®, Gmail®, Google® Contacts, Google Calendar™, Dropbox, LinkedIn®, and Facebook® right from within Act! with all the advantages this brings to streamline your business and enhance your social media profile. Add-ons - increase the functionality of your Act! CRM Learn more about out full range of add-ons. Sales Automation – Automate key follow-up activities based on dynamic criteria you define to save time. Smart Task options - Use to automatically send email campaigns, schedule follow-up activities with hot leads and more. Email marketing – Easily access Contacts, Groups and Companies to build targeted email lists. Create, send and track professional, eye-catching email campaigns to reach customers and prospects with the right message at the right time and new filters for organising your Call Lists. AlphaLogix are Act! Hosted Partners, Act! Developers and Act! Silver Status Consultants, Accredited by Swiftpage, with many years of experience in all versions of Act!